Our penultimate month in South America (that’s right, five down, only one to go!) was a welcome change from the backpacking we’ve been enjoying for the majority of our trip. We returned to our Abu Dhabi roots and soaked in the more luxurious side of Ecuador – after all, nobody has the budget for five-star hotels for six months at a time but everyone loves a good treat every now and then! For those of you operating on more of a budget though, don’t worry, there’s something in here to suit you too. As always, we’re all about those ‘bucket list adventures’! If you’re new around here, we suggest you check out our first, second, third and fourth months on the road in South America before starting on month five. The highlight of our entire South America trip (and there have been lots of highlights so that’s not an easy feat) and potentially of our travelling career, our time in the Galápagos was incredible. We’re not going to go into a tonne of detail here as there will be plenty to come, but you should know that it’s worth scrimping, saving and bending over backwards to make a cruise around this incredible islands work! Accommodation: 7 nights aboard the MV Origin – Ecoventura‘s luxury ship. Followed by 2 nights at Casa de Jeimy in a private room @ USD22.40 each/night (NZD31.55) on San Cristobal. Activities: Incredible animals and nature galore! If there’s one place in the world where you can see a massive range of animals in their natural habitat, the Galápagos is it. We swam with sea lions, sea turtles, marine iguanas, reef sharks and marble rays. We also got up close and personal with massive land iguanas, tortoises, whales, hummingbirds and my favourite, the beautiful boobies, all whilst relaxing on a luxury vessel with the most fabulous guests and staff. We also intentionally checked out a day trip (as lots of the backpackers we’ve met along the way have talked about them as a cheaper alternative). To be frank though, it didn’t compare, even remotely. If you’re able to, we really would recommend saving more and getting yourself aboard a ship to see the outer islands. Onwards travel to Quito: Flying TAME from San Cristobal (SCY) to Quito (UIO) for USD193.30 each (NZD269.75). It’s important to note that Ecuadorian’s get a discount on flights – don’t tick this box unless you’re eligible for the discount, otherwise you will be denied boarding. The capital city of Ecuador sprawls out from North to South but it’s the historic town centre where you’ll want to spend most of your time. Though the traffic is, at times, a real nightmare, we enjoyed spending a few days in the city. Accommodation: 2 nights in a private room at Casa Gangotena. Absolutely old-school charm, this hotel is a must in the city if you’re looking to splurge. Activities: A guided tour that took us through a local neighbourhood within Quito, showing us a side of the city that few visitors get to experience. It was followed by a visit to the most iconic spots in the historic centre and the most fabulous museum. If you’re in Quito, we highly recommend this alternative walking tour, ‘Live Quito like a local‘. Onwards travel to Mashpi: Organised by Mashpi Lodge – we joined a mini-bus of other guests, stopping at a local museum on the way. Having already immersed ourselves into the jungle in Peru, we knew we wanted another experience along the same line. Masphi offered the opportunity to do exactly that, but this time in the lap of absolute luxury in the cloud forest. Accommodation: 2 nights in a private room at Mashpi Lodge – a National Geographic “Unique Lodge of the World”. As you’d expect, it was absolutely incredible! Activities: Night cloud forest walks, a ride on their very own cable car (known as the ‘dragonfly’) and their skybike, along with hikes to cascading waterfalls, hummingbird spotting, toucan sightings and more. Onwards travel to Baños: Mashpi Lodge took us back to Quito and from there, we boarded a bus to Baños for USD4.40 each (NZD6.15). We got our ticket at the Terminal Terrestre Quitumbe and jumped on the next available bus – they run frequently, all day. The adventure capital of Ecuador, Baños was always a must-see in Ecuador as far as we were concerned. We loved it so much that we spent a full week there checking out all this vibrant little town had to offer. Accommodation: 7 nights in a private room at Hostal Princesa Maria @ USD10.50 each/night (NZD14.80). A quiet hostel, as long as you ask for a room upstairs. Victor was an incredibly friendly host! He didn’t speak a great deal of English but was happy to go out of his way to help. 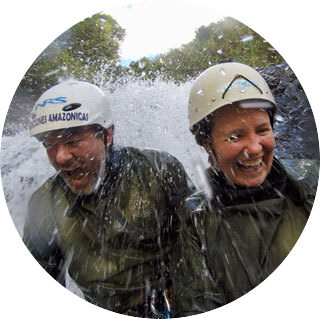 Activities: Our hostel organised for us to go whitewater rafting (USD20/NZD27.90 each) and canyoning (USD25/NZD34.90 each) with Expediciones Amazónicas – both were great fun and excellent value for money. The team also had high-quality gear and well-trained, English speaking guides. We also took local buses around town – we went up to Casa Del Arbol where we swung at the end of the world and also visited Pailon del Diablo (the Devil’s Cauldron – a stunning waterfall). Onwards travel to Latacunga: Again, buses are easy to organise on the day. We caught the bus from Baños to the turn-off (a big roundabout) of Latacunga – just be sure to let the attendant know that you want to get off at Latacunga and he’ll point it out to you. From there, taxi’s will take you into town (no more than USD4). Unfortunately, I lost our receipt but the bus Quito-Latacunga was only a couple of US dollars each. We caught a local bus in the morning from Latacunga to Sigchos (USD2.30/NZD3.20) each and from there, hiked to our next stop for the following three days. At the conclusion of the hike, we made the decision not to stay in Quilotoa (though it looked like a great little spot on top of the mountain), instead catching a ride with in ute back to Zumbahua (USD2 per person) and then a bus to Latacunga (another few dollars). 1 night in a 6-bed dorm at Llullu Llama (Isinlivi). Activities: Hiking, hiking and more hiking! We hiked from each location to the next, always with the fabulous new friends we made on the loop. Compared to the scenery we’ve seen on other hikes (and let’s face it, we’ve been spoilt by Patagonia and Peru), it wasn’t as spectacular but the people we met really made the trip! Onwards travel to Bogota: We were planning to catch a bus (all 34 hours of it!) but when it sold out, some of our new friends very kindly came to the rescue and helped us by letting us fly standby with them. The flights are expensive normally so if you’re planning on taking one, definitely book in advance. Alternatively, if you do plan on catching the bus, Cruz del Sur will take you all the way through (which was our preference to save on accommodation and lugging our gear from bus to bus), or you can take a combination of local buses (which would be cheaper but would take much longer). After five months of travelling, all we’ve ever heard people do it rave about Colombia! After a night in Bogota, I must admit, we were starting to wonder why. It’s not that there’s anything wrong with the city (in fact it was nice to get back to the bright lights again), but it just didn’t wow us. Rio? You bet! Lima? What a pleasant surprise. Bogota? Aside from the gorgeous street art, it didn’t do a lot for us. Accommodation: 2 nights in a 5-bed mixed dorm at Hostel Casa 32 DC @ USD7 each/night (NZD9.75). The beds were comfortable but the bathrooms and kitchen were an absolute mess (and I’m not the cleanest person in the world, so that’s saying something!). The people were lovely so it’s a pity that we can’t really recommend this hostel. On the upside though, it was cheap! Activities: We joined the Bogota Graffiti Tour which was a fabulous way to see the more authentic side of Colombia’s capital city – it’s a tips only tour and certainly something we’d recommend doing whilst in town (just book online ahead of time if possible). Onwards travel to Salento: We caught a local mini-bus from Bogota to Armenia and then on to Salento. It was straightforward but we learnt a few lessons on the way. If you’re making the journey, we have full instructions for you here. A colourful little colonial town, buzzing with New Years excitement, wax palm trees reaching high into the sky, coffee plantations and hummingbirds buzzing around – what’s not to love about beautiful Salento? Accommodation: 3 nights in a private room at Walker’s House Hostel. Activities: We hiked the Cocora Valley, completing the full loop (starting at the fish farm, taking in the hummingbirds and finishing with the palms). It was a full day and relatively challenging due to the massive amount of rain they got the night before (and unbelievably muddy conditions) but it was well worth it. Rides out to the Valley (and back) are COP3,800 each way (USD 1.30/NZD1.80 per person), the fish farm is COP3,000 each (USD 1.05/NZD1.45 including a bag of food), entrance to the park itself is COP2,000 (USD0.70/NZD0.95) and the hummingbirds are COP5,000 each (USD1.70/NZD2.50 which includes a drink). Food and drinks are available at a few different points on the walk but we packed sandwiches and drinks to take with us, making for a reasonably cheap day out! Onwards travel to Medellín: Again, we bused but this time on a direct service which made life so much easier! COP47,000 (USD15.75/NZD22.15) was all it cost us and full instructions can be found in our guide. Ah, beautiful Medellín! Colombia’s second largest city really is a world away from Bogota and an easy place to spend a fair amount of time in! Accommodation: 1 night in a 4-bed dorm at the Samarian Hostel @ COP23,300 each/night (USD7.95/NZD11.20) with lovely travellers (but small rooms and cold showers!) before moving into a 5-bed dorm at BlackPine Hostel @ COP33,300each/night (USD11.35/NZD16) for 7 nights. We loved BlackPine – a great location, clean and tidy, comfortable beds and awesome staff. Activities: Paragliding with DragonFLY (normally COP130,000) – absolutely amazing! We also toured both Comuna 13 and La Sierra in what were memorable and interesting visits (COP70,000 each, all inclusive). Finally, we headed out to Guatape with VIT Escobar Paintball and though we wanted to love our day, practically everything that could go wrong, did! I’m sure a normal tour with them is great, but when things go wrong, they really do and for this reason, I’m not sure we could recommend them (more on this soon). Guatape is lovely though and well worth a visit, either with another company or independently on the bus. Onwards travel to Cartagena: Flight with VivaColombia from Medellín to Cartagena. Though we’re flying with a discount carrier, we have a fair few bags now (those llama blankets were too hard to ignore) so we’ve paid COP260,291 (USD89.60/NZD125.05) each. This will be our last flight before leaving South America behind! … and that’s all for another month! Always preload maps onto your phone. I generally do but occasionally I forget. We got a reality check in Quito though where we had no choice but to get into an unmarked, unregistered taxi. Initially, the driver said he knew where he was going but 1/3 of the way into the trip he kept asking if we did (even though he had working sat nav). We realised at that point in time, how vulnerable we were – for all we knew, he was driving us in the opposite direction in the dead of the night (as he continually said ‘two people, two people’ on the phone in Spanish… I was terrified we were about to be mugged! Had we had our maps loaded, we’d have been able to follow along on our phones and the ride would have been much more pleasant. Long-term travel is tiring! I’m not sure if it’s just because the end is near or because we’ve picked up the speed of our travel but we’re pretty tired now. We’re making sure to allow ourselves some ‘down days’ where we just vege out because at this stage, we need them! It’s hard to believe our time here is coming to an end. With a month to go, we’re starting to think about jobs, housing and life back in New Zealand but the fun’s not over just yet… stay tuned for the rest of our Colombian itinerary along with San Francisco and Hawaii in the US. This entry was posted in Colombia, Ecuador, Itineraries, Monthly Round-Up, South America. Bookmark the permalink.